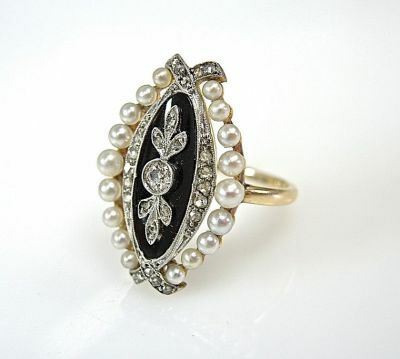 A beautiful antique platinum and 14kt yellow gold ring featuring 1 flat oval onyx, approx. 16.0x6.0x1.57mm with 1 old European cut diamond, est. 0.09ct (SI1 clarity: I-J colour) and 26 rose cut diamonds, est. 0.21ct (SI clarity: I-J colour) and 18 creamy white cultured pearls, approx. 1.8-2.8mm.